One of the most important developments in the study of Russian history in the last decade or so is the “religious turn,” which, among other things, has pushed the study of Russian Orthodoxy beyond the conventions of church, theology, and doctrine toward the study of lived religion. Yet, many of the same scholars who study Orthodoxy as everyday practice have unknowingly become entangled in the very categories they seek to move beyond—that is, church, theology, and doctrine. 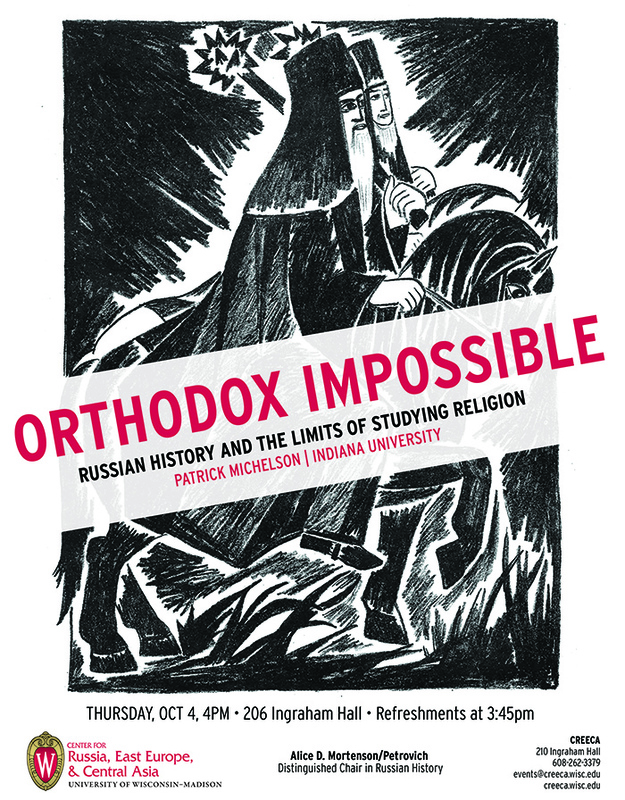 This talk by Patrick Michelson explores these entanglements and their implications for the ways in which we understand this complex, contingent, and multivalent thing called Russian Orthodoxy. Patrick Michelson is Associate Professor of Religious Studies at Indiana University. He is the author of Beyond the Monastery Walls: The Ascetic Revolution in Russian Orthodox Thought, 1814–1914 (2017) and a co-editor of Thinking Orthodox in Modern Russia: Culture, History, Context (2014), both of which were published by the University of Wisconsin Press.